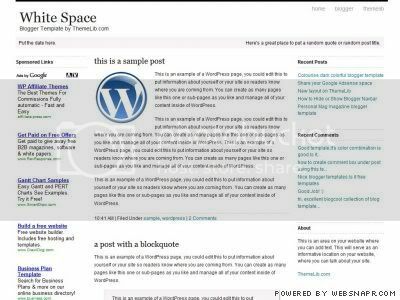 White Space is a minimalistic 3-column Wordpress Theme, original designed by Brian Gardner. ThemeLib converted it from Wordpress Theme to xml Blogger Template for Blog*Spot bloggers. 8 Responses to "White space blogger template"
i want to insert before or after each ttile post a java script code. It very Clear and easy cathing..
Can you please help me insert a personal JPEG header that I created in photoshop? Thank you.